THE NATURAL HAVEN: Could stretching natural hair be harmful? Could stretching natural hair be harmful? Some of you may have caught this one on BGLH, but here it is if you haven't. This is to answer the question that many of you ask me.......is it possible to damage hair while stretching it to combat shrinkage and tangling? Yes stretching hair excessively could be harmful but low levels of stretching are perfectly fine and can be useful in hair maintenance. Scientists have demonstrated that hair can recover very well from a 20-30% extension of the strand (Journal of the Society of Cosmetic Chemists, pp 13-26, 1996). The stretched strand will recover its full strength once the stretching force is released and the hair is dipped in water. Why the dip in water? Water has a key role in making hair flexible and strong as it slightly changes the protein (keratin) in hair. Do note that for styling, you do not have to do the dip, it may reverse the stretching process. However, when you are done with the style, a little water will help you have stronger hair to handle the next styling or maintenance process. 2 How can you tell if you are in the safe limit of stretching? It is pretty easy to read a 20-30% stretch in a lab but not really possible in a real life situation. As a general guide, if you retain some texture in your hair while stretching, you are probably in the safe region. 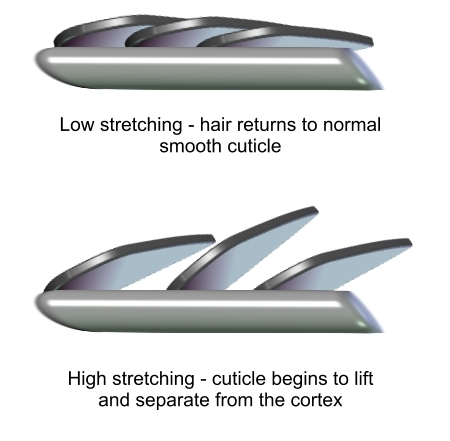 Aiming to completely smooth out a curl or kink with stretching has the potential to over-stretch the hair. As a general rule if your hair shrinks to 4 inches and is actually 10 inches in length, attempting to stretch it to 6-8 inches is probably better than trying to get to the full length. 3. 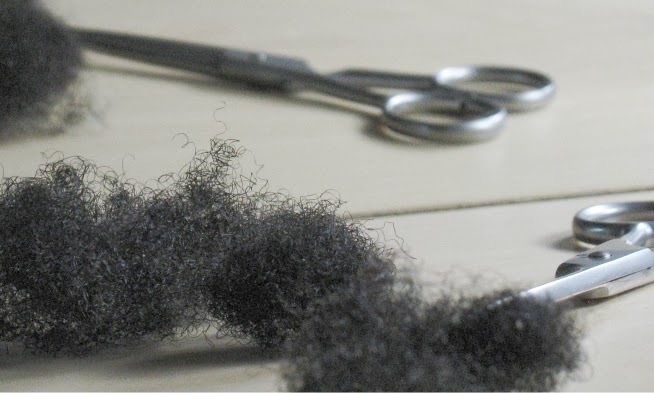 What happens if you stretch hair over the safe limit? By now, most of us will know hair has a cortex and a cuticle. The cortex is the strength bearing part of hair and it will generally not suffer too much. However, the cuticle of hair can undergo a dramatic fail with whole scales lifting and separating from the cortex. This can progress to sections of the hair having no cuticle and therefore the cortex in these parts gets exposed to the full brunt of damage that the cuticle would normally protect it from. 4. Should you stretch hair when it is wet or dry? You should avoid stretching hair when wet, it can easily break (Journal of the Society of Cosmetic Chemists, pp 449-467,1978). However, when it is completely dry, it lacks flexibility. Stretching hair which is around 70-80% dry is likely to be a good mix of flexibility and strength. How interesting, could this contribute to the reason flat ironing/ blow drying hair straight is so damaging? Or does the addition of heat mean the process is completely different? Oh you are right Chantelle Emily, stretching hair while flat ironing and blow drying does need to be done carefully. The addition of heat does further impact the hair but if you overstretch even at low heat, you can get the same damage. Do you think using a high amount of protein during stretching would help mitigate some of this damage? No, protein actually makes hair stiffer and less elastic (therefore stronger but less flexible). The best thing to do is not to overstretch by always keeping some texture in the hair. I do a braid-outs on my damp hair frequently and preserve them at night by doing dry braid-outs. My hair gets stretched by using this method but does not maintain moisture well. I use a gel and conditioner and sometimes a glycerin product on damp hair for my braid-outs. I would use oil or pomades in my hair to seal in the moisture but my hair does not respond well to either except the ends. Now, since reading this article, I am thinking that I may be stretching out my hair too much by doing dry braid-outs to preserve my hair at night and subsequently my hair is losing moisture as well. What are your thoughts concerning my dilemma JC? Very interesting article. Lends credence to the fact that when I keep my hair in its curly state I experience little to no breakage. When I stretch it (no heat), I always have some breakage. I stretched my hair with curlformers and then wrapped it to get a smooth stretch. While the results were nice, that stretch caused some breakage. Suffice it to say I won't be doing that too often!